Live it! 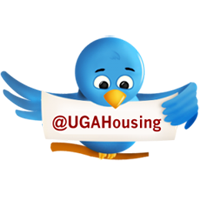 UGA Housing: Volunteer for #HDWH14! Do you have a passion for serving others? Are you interested in being part of the team and welcoming new students to campus? Volunteer to help with move in during the Hunker Down with Housing program. As a volunteer, you will assist the university as the class of 2018 moves onto campus. In addition, you will be able to move in early, receive a Hunker Down T-shirt, and meals for the days you volunteer. In the past, volunteers have found that participating in Hunker Down is a very rewarding experience - and the perks are great too! Hairy Dawg pitches in during #HDWH13! This year, we're hosting three interest meetings for students who are interested in learning more about the volunteer process for Hunker Down. Volunteers who attend the volunteer interest meeting will receive priority scheduling for Hunker Down with Housing days. If you are unable to attend the interest meetings, you can still apply to volunteer at http://bit.ly/1dIekBV. We will accept volunteers until July 18, 2014. Hunker Down with Housing will be held on August 12 - 13, 2014. We look forward to hunkering down with you! Contact us at hunkerdn@uga.edu for additional questions and follow #HDWH14 on Twitter and Instagram for updates!